Bring the feel of a real alley right to your facility. 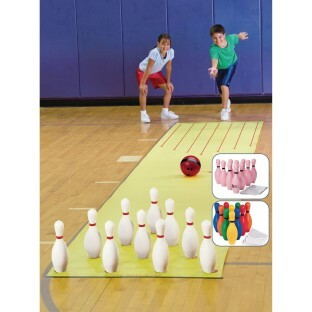 Roll-out plastic lane, rubber ball, 10 weighted pins, scoresheet pad, pin set-up sheet, floor tape. Packs are available with white, pink or rainbow pins. Bring the feel of a real alley right to your facility! Includes our 20'L x 39" wide roll out plastic lane, a 2-1/2-pound unbreakable rubber ball, ten 15" high weighted bowling pins, a pad of 100 scoresheets, a pin set-up sheet and a roll of 2" wide floor tape. Packs are available with white, pink or rainbow pins.